If there is one thing to know about me – it is that I love to race. I have an addictive, competitive personality and racing suits it perfectly. 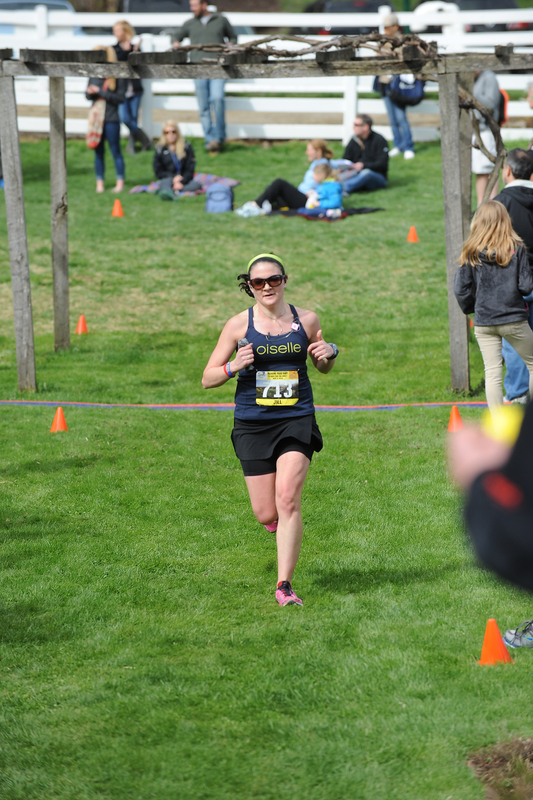 I don’t always ever go out there to win, or to PR, sometimes I just out there with an attempt to better myself – with a challenging course or in challenging conditions (ask me about the 50K I ran last July…). 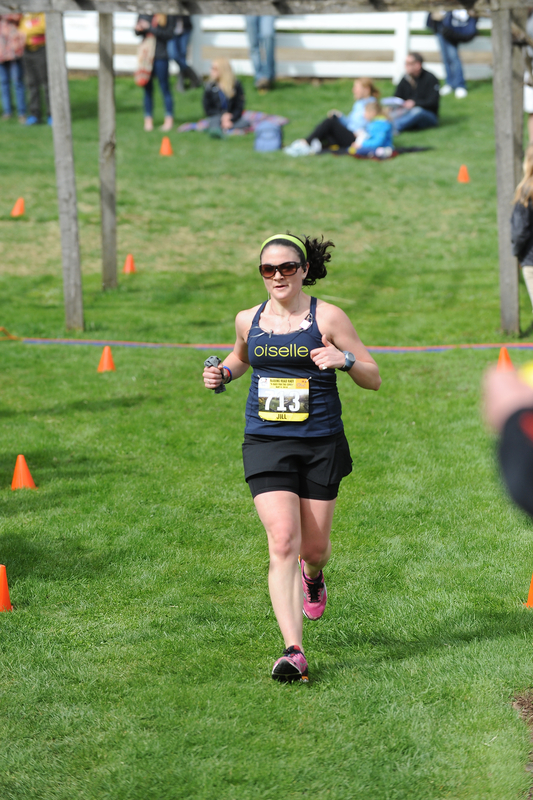 The long of the short is (I wrote a 3-part post about injury/comeback and opted to keep them for my eyes only) I was injured while racing a 20K on February 23rd. The hills were steep and abundant and I wasn’t prepared for them – so I suffered for it – with an injury to my lateral glute and my tensor fascia latae (TFL) muscle. I didn’t run for a month, and even faced my worst fear of needles and had 3 acupuncture sessions. It was maybe one of the worst injuries I’ve faced because I was uncomfortable and in pain all the time. Since then, it’s been a very slow build back. Some weeks I plan on running 4 times, and I only get in 2 runs. I will, absolutely, never force a run when I’m coming back from injury. I’m looking for an overall trend of forward progress right now and I’m getting it, running through anything that is even remotely a concern won’t keep me on the right track. I have a loose training plan that I work off of and am working diligently with strengthening, self-massage, and stretching/yoga work. The addition of the BOSU balance trainer has really added a much needed dimension to my strength training. This past Sunday, I was supposed to run the half marathon portion of the Redding Road Races (http://www.reddingroadrace.com/.) I emailed the Race Director a few days out after I realized that no matter how good I was feeling that a half marathon full of rolling hills (similar to what I dealt with in the 20K) was not a good idea and he allowed me to step back to the 7 mile race. 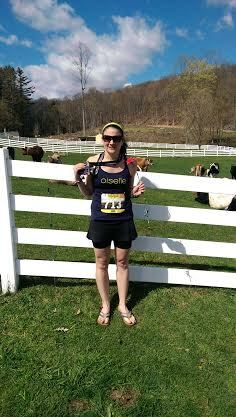 The race was about a 45 minute drive away and started at a small farm. It was one way in and one way out, so Brian and I opted to go to packet pickup on Saturday. [Sadly, his toe surgery recovery has been very slow and he isn’t running and wasn’t able to run Redding with me as planned.] The half started at 8AM on Sunday, with the 7 mile starting at 8:35AM. We got there just before 8AM and walked the 2/10ths of a mile to the farm (those running the half parked at the farm). Arriving at a race 30-45 minutes before is my preference. It gives me enough time to do what I need to do (check bag, use bathroom, get shoes on and strip down to what I’m racing in) – any more time and I’m anxious, any less time and I’m stressed. 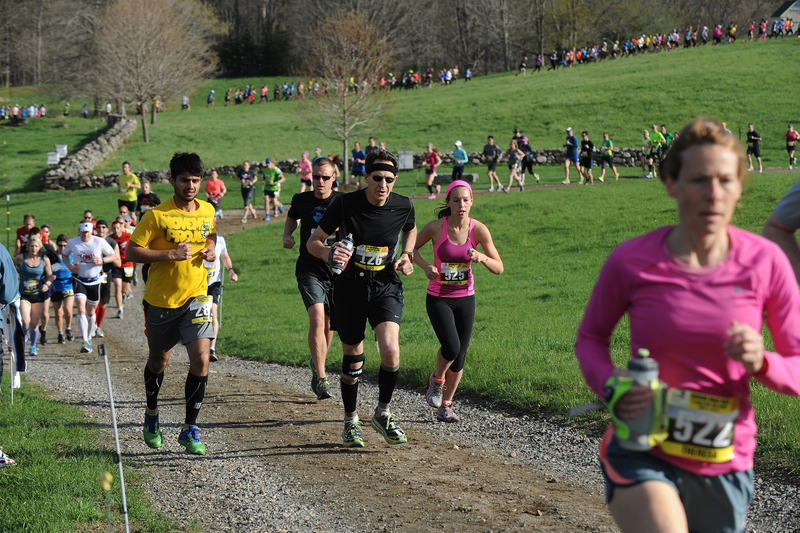 The race is really one of a kind in that it starts by doing a lap of the farm, along a dirt/gravel/grass path. Not the most ideal surfaces for me with my ankle stability issues but unique and fun for sure. And we just kept climbing or so it felt, it was a humid day and I felt good, but it was work even to run easy. We climbed up a hill and took a right over an overpass and then a sharp left to continue. Some guy at the top said “once you finish this climb, you have a 1 1/2 miles of flat” so I thought “Wow, really? I didn’t think there was much flat – misread the elevation chart then.” And no, he lied. At most we had 1/2 mile of flat before we went off the paved roads and into a state park and climbed up the dirt/gravel/potholes to our turn around spot. This was certainly where I started to feel it, I wasn’t conditioned enough for the climb and my body was sore but the hip and glute areas weren’t as bad as they could/should have been. The gravel and the climb through that section were what put me off a bit. We merged with the half marathoners almost seamlessly and it was nice to have additional company. Miles 5 to 6.5 were full of positive self-talk and trying to make sure I was aware of anything that felt off. I had told myself going into this race that I would walk if needed, but I didn’t need to. The last portion of any race is where I key into how I feel (ie how much do I have left in my legs, does anything hurt, do I have enough for a long fast finish or a short fast finish) in this instance, I figured I would slowly pick it up a bit – and then I hit the steep downhill. It was one of those hills that you have to fight for control on, and it was especially important for me to do so. I passed a few people which was a bit hard for me to believe, but there were a lot of people cheering and I picked up the pace a bit as it flattened out. But then there was a sharp left turn onto the gravel driveway, a significant curve to run through an open (milking?) barn, then the grass surface, a sharp right to run over some grass mounds, a finish line mat, and up a small hill to the actual finish line mat. Brian flagged me down with a “slow down” motion as I came flying out of the barn, but really my legs were just still coming off that hill and I had a lot of momentum. I did not fall, I did not hurt myself and I wrangled a 1:02.29 (8:56 pace). I was pleased with my effort and self-control so just a good return to the start (and finish) line for me. Oh and after the race, the computer told me I ran 28th in my division. Somewhat disappointed but aware I didn’t place, we left to go get some iced coffees. Except joke is on me apparently, because the results had me 3rd in my age group. Now I just have to find the time to pick up my prize. Sounds like a good race and the start of a great comeback.